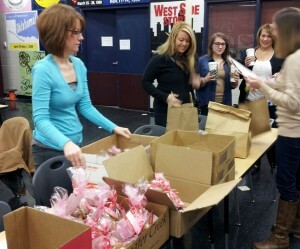 Members of Grace Fellowship, Pickerington, Ohio, baked and donated more than 700 dozen cookies that were given to teachers, police officers, and other public employees in the community. Community outreach is important at Grace Fellowship Church of Pickerington, Ohio (Keith Minier, pastor). “We want it to be part of the DNA and part of the culture of who we are and what we do,” says Nicole Waggoner, head of the Impact Team, the group who is responsible for planning such events. The biggest event they do each year is called Eggsplosion and takes place on Good Friday, according to Waggoner. 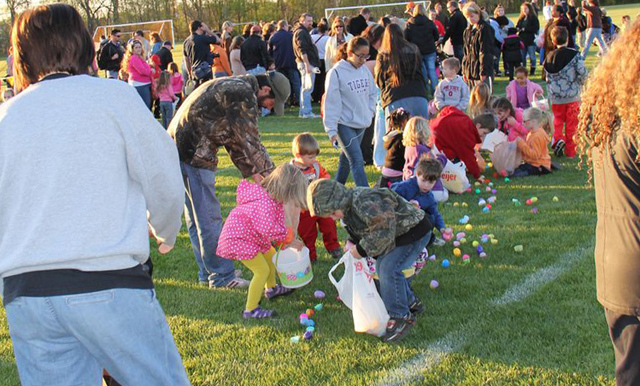 “A helicopter comes and drops empty plastic eggs onto a field. And then the kids collect the plastic eggs and exchange them for candy,” she explains. The annual Eggsplosion a Grace Fellowship in Pickerington, Ohio, includes an egg drop, a free meal, and carnival-style entertainment. And the event is growing. “It started with about 90 people. Two years ago we had about 1,100 people. Last year we had more than 3,000 people,” Waggoner reports. 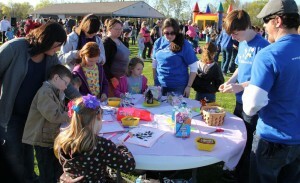 In addition to candy, the church provides a free meal and carnival-style entertainment. “And then as they leave, we hand them fliers inviting them to our Easter service,” she adds. Information about Eggsplosion appeared on the church’s website. Waggoner and her team also put up posters around the neighborhoods. “It’s grown in reputation to the point where people are contacting us now,” Waggoner adds.